I grew up understanding where my food came from. But through my lifetime, the way this country produced food changed dramatically. Going to the local butcher shop as a kid and going to the grocery store today are two completely different things. As an adult, I read some of the books and watched some of the movies about our current food system. So I started to pay more attention to my food choices (organic, sustainable, local). All the usual stuff. Then, I just felt overwhelmed. For years, I tried to do the right things. We grew our own organic produce, raised our own organic eggs, shopped the farmer’s markets. But many times, I still felt unsure about some of the food choices I was making. The bottom line was that I didn’t always have choices available that were good for my family AND good for the planet. I felt helpless with the choices. So I would do what I think most others do. I would just buy what was convenient. I actually had no idea if it was sustainable. I just needed to get food on the table. And with that came, guilt. Every 3 years, Polyface has an open day where they offer tours, give lectures about their sustainable farming system and basically share their lifestyle. It was amazing. I was so impressed with the system of farming this family used, but also their willingness to share their information with others. Within the same year, I wrote/produced an entire PBS episode on Joel Salatin and the Polyface Farm. 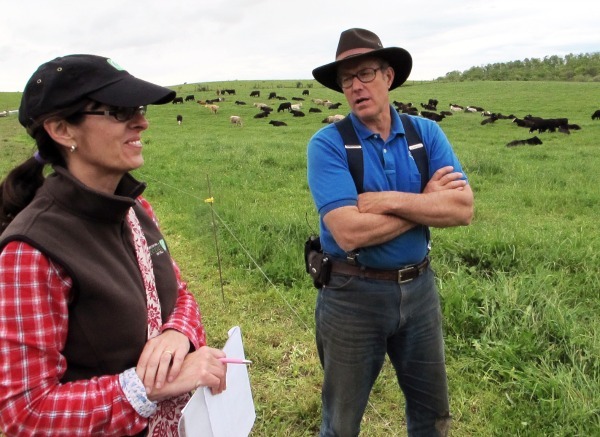 While filming, we got to spend 2 days just following Joel Salatin around Polyface chatting about his philosophies and practices. We were even invited into his home for dinner. Although I had read his books and seen the movies he was in, it was different hearing it directly from him. Joel has a way of making you feel empowered. And we are. I began to realize that I could make more of a difference with just a few simple changes. It wasn’t so overwhelming after all and I wasn’t so helpless with our current food system. I know you have heard that before. I had too. But it hadn’t REALLY sunk in before. If I want things to change, then I needed to vote with my dollars. I need to make even more of an effort to support the guys who do it right. I was already an organic food eater, but I started to buy food that was “beyond organic”. I wanted it to be as sustainable as possible and to me, that meant I needed to buy grass-fed beef instead of just buying meat that had been raised on “non-GMO grain” Yes, it is way more expensive, but that just made it more valuable to me. And it tastes better! It really does. Due to the higher cost of grass-fed meat, I now buy less meat. So, we have bumped up our non-meat choices of vegetables and grains, which is always a good thing. We are less wasteful with our food because everyone in my family now better understands the environmental costs as well as the monetary costs of our food. And as you can probably guess, canning and preserving is more important than ever before. 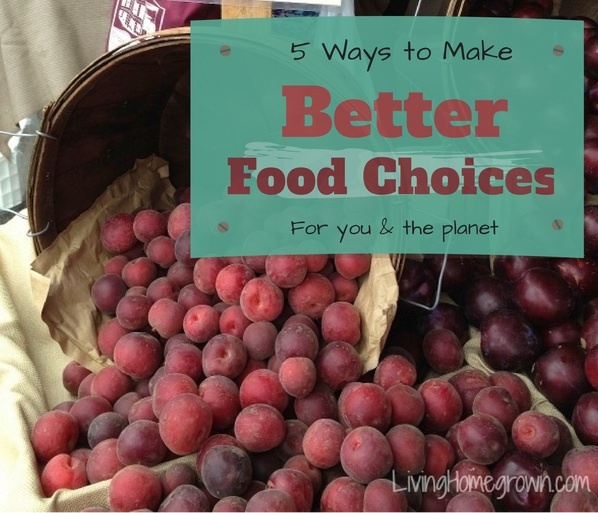 Preserving food is a simple way to help the planet and budget at the same time. You are giving your family wholesome food while throwing less away. It’s a win-win. I have always tried to support my local farmers and buy at farmer’s markets. But I now think it is important to seek out the ones that are going a step further in environmental responsibilities. A real sustainable farmer will have no problem answering your questions or even letting you visit the farm. 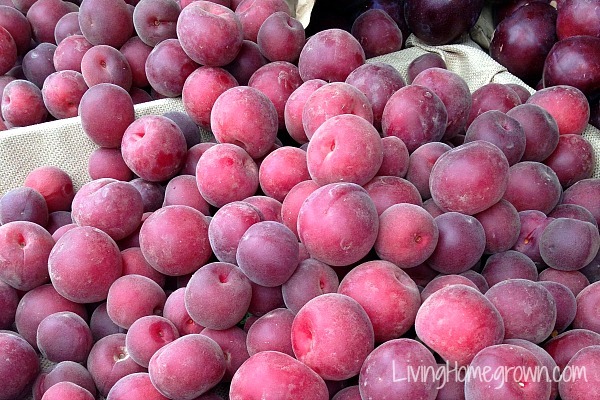 So when you visit the farmer’s markets ask about their production and better yet, try to visit in person if you can. I realized that we really do vote with our dollars. Every time we buy industrialized chicken from the supermarket, we are supporting that horrid system and the inhumane way those chickens were raised. 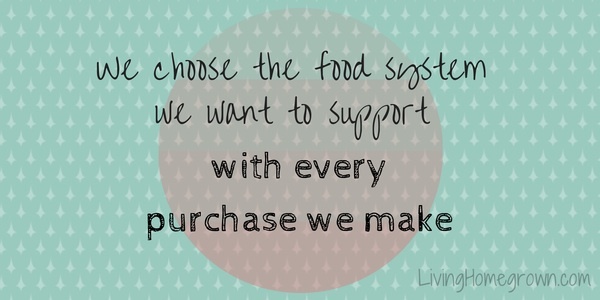 Every purchase makes a difference and I try much harder to support the system and the farmers who are doing it right. There are still a few things I eat that don’t fit the bill, but I am slowly trying to make more transitions. Each month, I get a little better. It’s a process. So don’t try to be perfect. Just try to be better! I am finding that it gets easier as I go. As one choice becomes routine, I can tackle the next one. 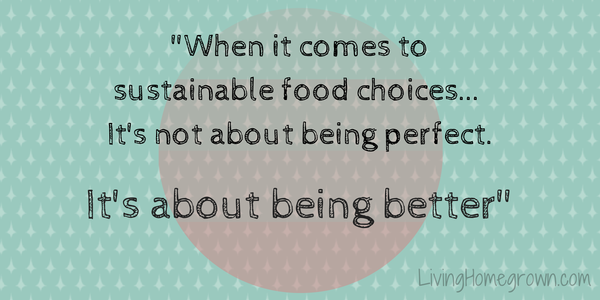 Are you trying to shift your food choices? It is hard as we Americans always want things now including change in our own lives, even tho we know that life just doesn’t work that way. I’m trying to be better but as with a lot of us have a long way to go. Your blog has inspired me to retry canning. This year it will be pickles and potatoes (I hope). Plus I have a small container garden that I’m trying peas and beans in pots, among other veggies. Teresa, you are so right, it can be overwhelming. We too have made gradual changes over the last few years-the only way to do it in my opinion. Great post! @ Holly- a lot of potatoes don’t hold their shape when canned. The ones a friend did will be handy to add to stews, but not much good for anything else. And they must be pressure canned. Potatoes can be ‘root cellared’ or stored in a cool dry place for months without canning. 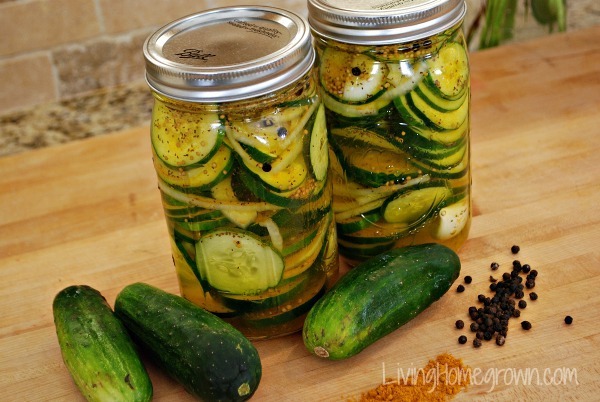 Pickles, on the other hand, are a great place to start (or re-enter) the canning world. I’ve bought pickles for years because we eat so few and they cost so little, I felt I couldn’t justify my time making them. When I read the label of our favorite brand and HFCS was listed, I decided it really was worth my time to make pickles. It was a few hours project, and I spent more on cukes than I think I usually do on a year’s worth of pickles, but they were organically grown by a farmer less than 10 miles away, and now I have 14 pretty jars with a short ingredient list sitting on my shelf. I love your newsletter.There are so many out there that I just delete on arrival. But when your newsletter arrives, it’s coffee time. Time to take a break and enjoy all the information. Just to say how much I enjoy you newsletter and blog. Thank you. Thank you so much Patsy. I’m so glad that you are enjoying it! You made my day. Truly! I’ve seen you on the GAGW TV show and was just inspired by episode 115 to check out your website. Holy Moses you have a spectacular wealth of information tucked into this URL 🙂 thank you! I am definitely booking this site for future viewings and am just so thankful for you and Joe Lamp’l and Chef Nathan for all the incredible work you do to help us learn how to live sustainably. Like your epiphany of voting with your dollars, I had the same thing happen to me this year listening to none other than Joel Salatin on your show. Again, thank you so much for what you are doing. You guys at GAGW have changed my life and worldview. Wow Drew – Thank you so very much for this nice comment. I will pass on your kind words to the whole TV team. Happy holidays to you as well! Just wanted to say real quick hiw much I’m enjoying your new podcast and let you know I tried your recipe for using fresh jam in a vinaigrette. Wow! I’m hooked. I don’t think I need to buy salad dressing anymore. I used a fig jam called The Fig Galaxy out of a jar and followed your instructions. Simply delicious. Now I can’t wait to do some canning of figs and compare the jar version with some fresh home made jam. I didn’t have red wine vinegar so I used regular vinegar (2 tbsp) and subbed in 1 tbsp of red wine that I had in a bottle on the counter. Tasted great! Thank you again for the podast and your great recipe ideas! Please keep up the wonderful work! Thank you Theresa, for sharing this beautiful article with us.